Every year, Giving USA comes out with its report on the state of the nonprofit sector. It measures where we are compared with where we were last year. The Fundraising Effectiveness Project does much the same. Many MSO’s do annual reports on the state of the nonprofit sector as do most of the nonprofits within the sector. But year-to-year is only part of the picture. Looking over time is far more useful and more truthful. I fell into this trap. In 2012, as my tax payments will attest, I had a really extraordinary year. As 2013 unfolded, things were not looking as good. Was I slipping? Was my business really going downhill? Then I did a more thorough analysis. In 2011, there were a bunch of clients who were very slow pay. In fact, a big chunk of change arrived in 2012 for work that had been completed in 2011. Equally bizarre, every single client I billed in 2012 paid in 2012. That was unusual. Typically, I get a lot of my December invoices paid in January of the following year. But in January of 2013, zip came in. Looking year to year, it appeared that my business is falling off; this despite more clients. But if I look at rolling averages, I’m doing well. Better, actually, than last year, which was better than the year before. The point being that year-to-year may tell you something, but beware of the apparent lessons. That was great! I was excited. “So how did you do that?” I asked enthusiastically. The answer: A million dollar bequest. Well, fantastic as that is, one thing you can count on: That person is not going to make another gift and you surely can’t be counting on getting another million dollar bequest next year. In fact, looking just at dollar amounts is a fool’s game. Over the years, the dollar amount of charitable gifts has gone up. But as everyone who has seen Dan Pallota’s Ted Talk knows, charitable giving has remained at about 2% of GDP for decades. What we need to measure is subtler. Is what you are raising sustainable? That is, are you bringing in a growing number of supporters to your organization while keeping those you already have? Is your funding base broad and diverse? If you are raising funds from only one group or worse, one or a handful of funders, you are courting danger. As Jeffrey Wilcox always says, better to have 100,000 people giving you $10 each than only one person giving you $1,000,000. If that one person deserts you for any reason, you are what I would elegantly say is SOL. On the other hand, if one or even 100 of your $10 donors stop giving to you, you still will be raising a fair amount of money. Do you have a lot of ways to cultivate your prospects? That is, can you continuously bring them closer to your organization? Do these cultivation opportunities allow you to learn as much about your prospect as they, presumably, are learning about the organizations? And finally, do you have a strong stewardship program? Note that much of what you are doing to cultivate prospects is exactly the kinds of things (the same things!) you need to do with your donors. 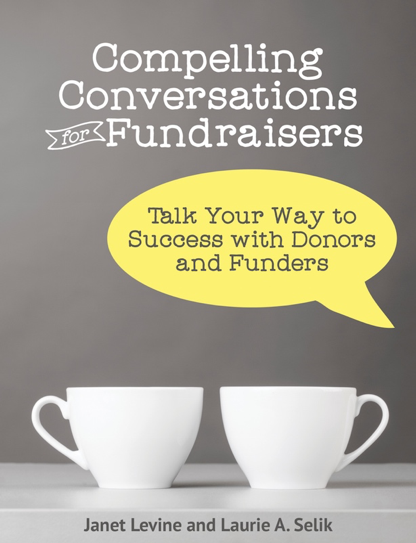 After all, we all know that your best prospect is an existing donor—so treat them as you do a new prospect. Engage, engage, engage. And don’t forget—engagement is a conversation. Don’t be telling all the time. Make sure you are asking. Look at your donors longitudinally. What is their giving over time? How are they connecting with you? And how are you continuously connecting with them? Janet Levine works with nonprofits, helping them to increase fundraising capacity and with nonprofit professionals, helping them to improve their productivity. Learn how Janet can help you at http://janetlevineconsulting.com. Contact her at janet@janetlevineconsulting.com. This entry was posted in fundraising and tagged clients, consistency, cultivation, donors, fundraising, longitudinal studies, productivity, prospecting, prospects, studies. Bookmark the permalink. I just LOVE the line about not getting another gift from a donor who leaves a bequest. Profound. ☺ See you soon.